New York magazine reports that in addition to pay and other issues, the strike is “rooted in a long-running battle over the explosive growth of charter schools in L.A.,” and the Wall Street Journal has highlighted the polarizing role of Austin Beutner, the pro-charter head of the Los Angeles Unified School District. UTLA head Caputo-Pearl “said teachers are worried Mr. Beutner’s proposal to restructure the district, which LAUSD hasn’t presented publicly, will encourage the opening of more charter schools.” Charter schools in L.A. have been unaccountable (video), says teacher Judy Arteaga, and have drained resources from traditional, community public schools, as In the Public Interest reports. The strike has been greeted by a massive outpouring of support from community groups, the labor movement, and progressive activist organizations, and is part of the wider national battle to support teachers and strengthen public education. The battle to rein in charter growth has also “sparked a revitalization” of the unions in recent years, Sarah Jaffee writes in The Nation. 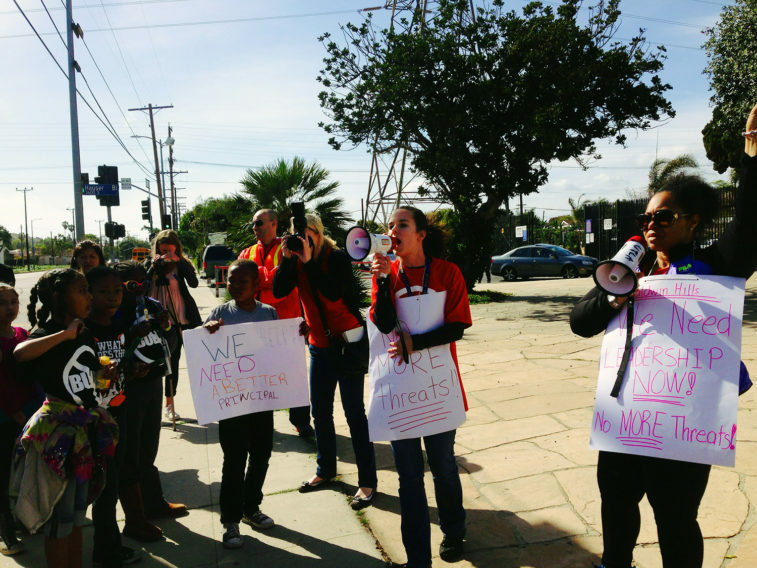 Jaffee points out that UTLA “is made up, overwhelmingly, of women as well and has more recently become majority teachers of color.” All of this activism across the country is turning the tide of public opinion against the charter school agenda of the billionaires, Jeff Bryant reports. 6) National: Democratic presidential hopeful Cory Booker is taking heat for his pro-charter school stance. “When Booker gave the keynote address at the ‘Project LIVE & Achieve’ Rally for Excellence today, he made it clear whose side he’s on. And it’s not parents, children or communities,” writes Gadfly’s Steven Singer. 7) National: CoreCivic is still operating during the government shutdown, but expects to be paid when it ends. 20) Tennessee: A Shelby County charter school may be forced to close by the school board “after allegations that teachers falsified records and left students to teach themselves.” WREG reports that “the office of charter schools says a whistleblower who came forward in June exposed a series of disturbing problems at Gateway, with allegations from unqualified teachers running classrooms, to grade-fixing. In one geometry class, every single student was given the same grade—a 92. Then, every student failed the year-end test. ‘The reason this was so difficult to catch is the school was falsifying its records,’” said Bradley Leon, chief of strategy and performance management for Shelby County Schools. The school board seems to have dropped the ball. 3) California/National: Whatever the outcome of negotiations between LAUSD and UTLA to conclude a new contract to end the Los Angeles teachers strike, funding issues for the district’s schools will be affected by legislative action at the state and federal levels. As Bill Raden of Capital & Main and Jennifer Medina of the New York Times point out, the provisions of the anti-tax Proposition 13 at the state level are impairing the ability of the state to help fund Los Angeles’ chronically underfunded schools.